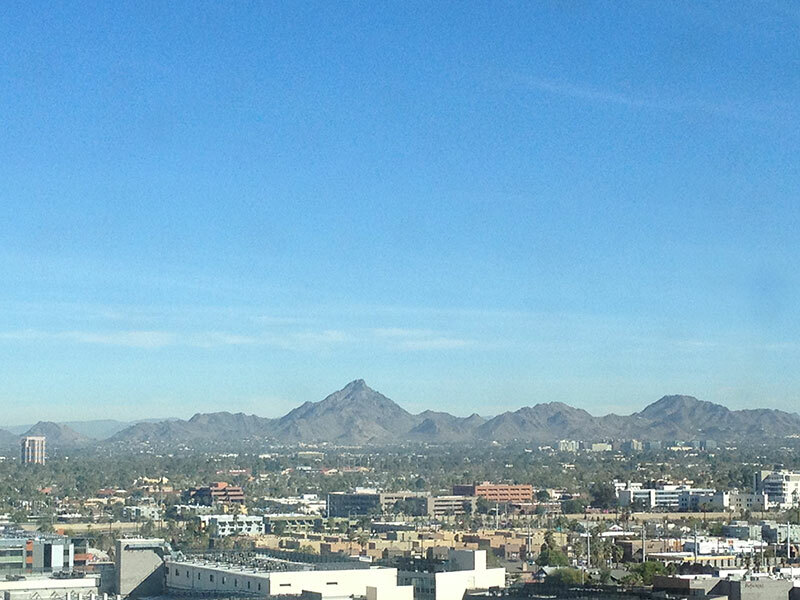 Mountain vista looking north from downtown Phoenix, Arizona, February 2014. Escaping the harsh wintery weeks of a typical east-coast February to travel across the continental U.S. via plane is a dream I’ve longheld since my childhood. This past December, I received news that one of my new widget locket pieces was selected to be included in the Mesa Contemporary Arts Museum’s 35th Annual Contemporary Crafts juried exhibition in sunny downtown Mesa, Arizona. What better excuse to see the gorgeous terrain of Arizona’s rugged mountain peaks and luscious, shady palm and cactus trees would I ever be handed? 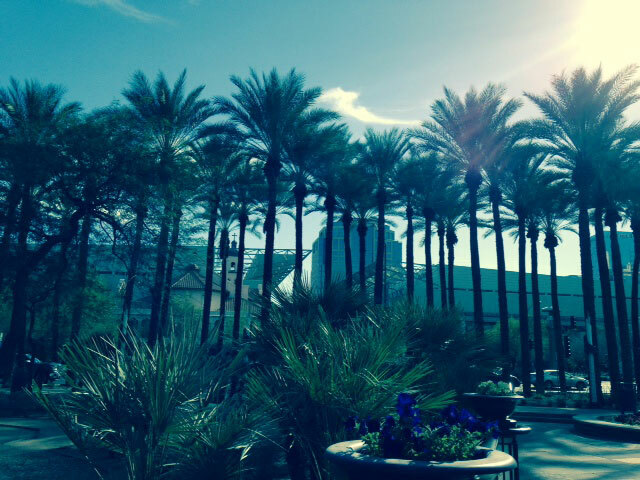 Tall palm trees overlook Arizona Center, taken February 2014 in downtown Phoenix, AZ. Having fallen in love at first sight with the southwest, I knew right away I would have to blog about more than just the art scene of the metropolitan Phoenix and Mesa areas. The first group of buildings that greeted my husband and I as we walked outside our hotel is known as Arizona Center, landscaped with the most fabulously sunny palm trees I’ve ever seen. This center is a mecca of shops, restaurants and office spaces that function like a small sanctuary within the busier downtown area of North 3rd and East Van Buren Streets. The business women and men dress to impress here, as I noticed immediately, even though there are also young backpack-wearing students from Arizona State University’s downtown Phoenix campus passing through this city center. 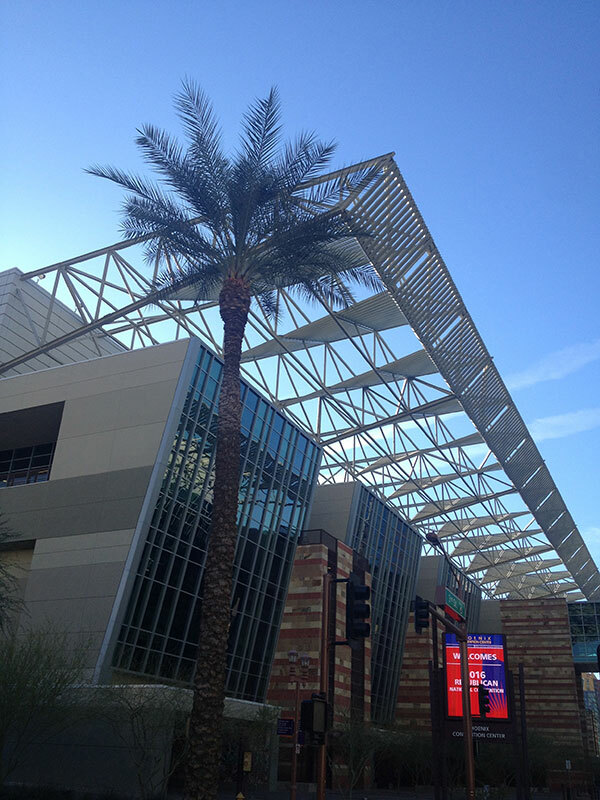 Phoenix Convention Center, photo taken February, 2014 in downtown Phoenix, AZ. Several things jumped out at my east-coast U.S. point-of-view right away about Phoenix, but especially: the restaurants and eateries offer much healthier dining choices overall, with nearly everything being gluten-free. The first meal we enjoyed was lunch at District American Kitchen, located adjacent to the Sheraton Downtown Phoenix Hotel. Second thing: being the huge coffee nut that I am, naturally I wanted to try the Starbucks Coffee located at the Arizona Center also. Upon ordering our coffees and breakfast items, I nearly fainted when the manager of this Starbucks walked outside and hand-delivered our food to us. People seem to be extremely nice and welcoming in Phoenix, as we met several nice folks who thought nothing unusual of striking up conversations with us throughout our southwest visit. Coming from my Philadelphia frame of reference, you’d be hard-pressed to find any restaurant manager or locals to go out of their way to be this kind; Philadelphia/New York/Baltimore/D.C., inclusive. Mesa Contemporary Arts Museum (rear facade of bldg.) on opening night, February 14th, 2014. Even though the city of Mesa is a short drive from downtown Phoenix, the closer to opening night of my exhibit we moved our home-base to Mesa. 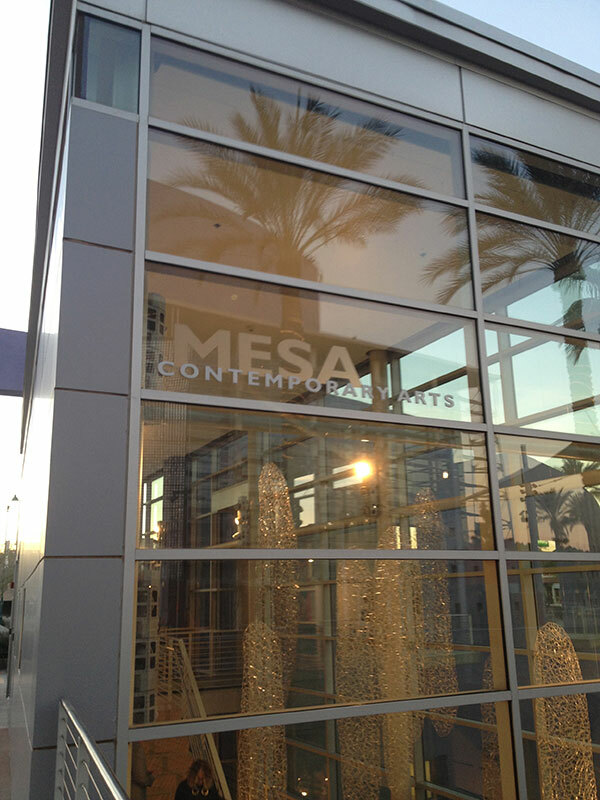 The Mesa Arts Center is actually the largest arts and museum complex in the entire state of Arizona and is owned by the city of Mesa. It is home to four theaters, five art galleries and fourteen art studios. The music venues within the Mesa Arts Center host amazing musical and theatrical acts, such as jazz musician Diana Krall who’ll be performing at the visually magnificent Ikeda Theater this April, 2014. It is also home to the Southwest Shakespeare Company. The architecturally stunning Mesa Contemporary Arts Museum (known as the MCA Museum, for short) is comprised of five different galleries. The Dobson Main Gallery is the location for the 35th Annual Contemporary Crafts exhibition juried by Independent Curator Julie Muñiz, now open through April 13th, 2014, featuring thirty-five artists from fourteen states working in fine contemporary craft media such as metalwork, jewelry, ceramics, fiber, wood and glass. More to come in an upcoming post to artdoesmatter about my observations of artwork viewed in-person opening night, as well as my additional “Art Trek” adventures in Scottsdale. Check back in soon to read Parts II and III! All photographs in this blog entry are copyright Patricia Sullivan/artdoesmatter and may not be used without my permission. In addition, the locations mentioned in this blog post are solely my own choice of adventures, and I receive no compensation for any endorsements. Wow! I didn’t realize how prestigious the show your work was accepted into was! Congratulations, that is awesome. I’m so glad you were in Phoenix in December — I was there once in May and thought I was going to die, it was so hot. Looking forward to seeing some pictures of the artwork (hopefully) and your continued adventure. Thanks so much Laura for your nice comments! Actually, I found out I was accepted by the juror in Dec., but I visited Phoenix just last week for the museum’s opening night! So the AZ weather was just perfect in February – in fact, my friends there said it was a “winter heatwave”! Thanks again! Congratulations on your acceptance into the Mesa show–sounds like a wonderful exhibit. VB, many thanks. I’m pretty stoked to be a part of such a great show. Thanks for your visit and nice comment! What a great experience! I checked the restaurant menu and have decided on “3rd street salad” should I find myself dining at District. That museum looks wonderful. I would love to visit it too. I am glad you got the opportunity to see the exhibition in real life and time. I am also glad your husband got to go too. You think they are friendly? Wait until you visit aussieland! 🙂 I am looking forward to your next installments. Yay, all sounds very exciting Patricia… I haven’t been to the US, hope to get there one day to see the sites. Looking forward to the ‘exhibition’ blog post! Dawn, it really was a fantastic trip, seeing Arizona. The climate there sounds alot like a milder-temps version of Ballarat (except Arizona summers can reach 115-120 degrees F.) Now that sounds exactly like your part of Oz, but since we were there only in Feb. – it was so nice and cool in the evening and just steady sunshine daily. I highly recommend if you do travel to the U.S.; the mountains in the southwest states are so stunning. Thank you so much for your wonderful comments and visit today! Patricia congratulations! I am looking forward to your forthcoming post about the show! Mesa sounds great for winter and what a perfect time to visit. My brother lives in Scottsdale so I am a bit familiar with the terrain. I would definitely not like summer out there… they are fortunate to have other residences outside of the area where they escape the heat. Anita, I’m so happy to hear from you! Both my husband and I adored Scottsdale, and I hope to do a “Part 3” to this blog – based on the beauty of the town and the Thursday night “ArtWalk” that Scottsdale galleries are famed for offering. While we were there, the Phoenix/Mesa/Scottsdale metro area was under a winter “heat wave”, w/ temps reaching 89 F last Saturday! So I can only imagine what August must be like! My husband and I were so lucky to have many old friends now living in AZ (formerly from Philly/NJ areas) to meet up with at my opening; was one of the largest gatherings I’ve ever had at a show! I hope to have a new write-up about the artwork I viewed at the museum, too. I hope you’re doing well and that Chicago is experiencing a winter “thaw-out” this weekend, as we are here! I adore the image you captured of the rows of tall palm trees. It has an almost surreal quality to it. What device did you use to capture it? Congratulations on your acceptance to the Mesa show! What a great honor, and what a wonderful reason to step away from this difficult Northeastern freeze one that,*definitely* rivals a good old fashioned Minnesota winter. Happy blogging, Patricia. I look forward to your future posts in this series. Thank you, Gina. The row of palm trees photo was taken in very-bright and direct afternoon hazy sunshine with my handy iPhone 4S. While I did post it later to my Instagram app – I was careful to use zero filters. I’ve never seen an act of nature produce the miracle-moment shot I feel I was handed!! That intense blue color of the daylight just overwhelmed all other tones present. TY also for your support and encouragement about the Mesa Arts Museum show. The quality of artwork chosen plus the stunning architecture of the facility is mind-boggling to me, since I look at everything w/ the mental filter of east-coast-city artworld “grittiness”! TY so much for your lovely comments and stopping by! Patricia, we’ve had snow here 3 days in a row, when normally, this time of year, we enjoy mild temperatures and the first blooms of the season (forsythia, camellia, etc.). I needed to escape too, and your blog post came in at the right time! I really look forward to reading your next posts on the sunny Southwest, and especially on the opening and the art show at the MCA Museum. Congratulations! Dominique, you can’t imagine how much I can appreciate where you’re coming from re: the unexpected snow this winter. I scrambled 48 hours before to change our flight plans to ensure we’d “get out of dodge” before a huge storm hit the Philadelphia area. In the end, it was worth the 100 phone calls and heartache! Had I not adjusted our original plans, we would’ve missed the opening night and I wouldn’t have been so lucky to see all the work of these incredibly talented craft artists, in-person!! Stay warm and hopeful towards spring, and thanks again so very much for your fabulous comments, Dominique! Lovely images and a good read. Sounds as though you had sime wonderful surprises in the south-west. As far as friendliness I have always found plenty of that in the US! But i think climate has a bit to do with it. If you are muffled in big coats and scarves it is difficult to convey much instant bon-homie but thongs shorts and t-shirts make it easier somehow. Trouble with my phone posting…looking forward to seeing and reading more Patricia! Congratulations on being in this prestigious show. I love Phoenix, art and your blog! Big Congrats to you! Victoria, thanks so much. It was such a fabulous trip for me, seeing the Phoenix metro area and experiencing all the great art! Thanks so much for stopping by and commenting! Have a lovely day!